The latest MH17 crash news is that Malaysia Airlines has released the manifest or list of names of passengers and crew of the flight. 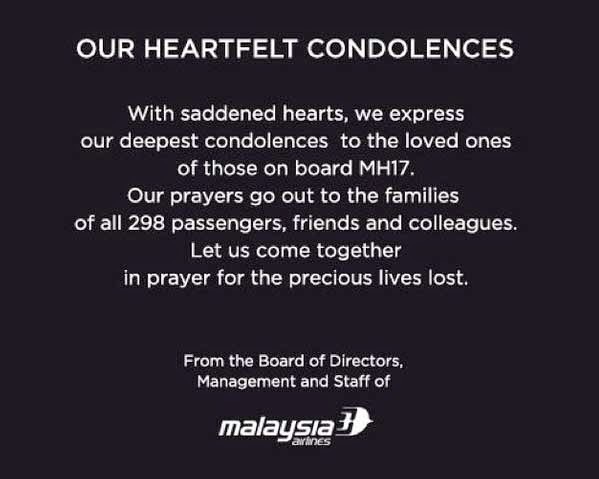 In a media statement issued Saturday night, Malaysia Airlines appealed to family members and friends of those onboard MH17 to contact the airline. The company also requested for cooperation from media to "respect the privacy of the grieving families." "The airline’s top priority remains to provide care and assistance to the families of the passengers and crew and any information with regards to their movement will not be made public," the statement read. The airliner said they "have made every effort to establish contact with the next-of-kin" with the assistance of various foreign embassies, but failed to identify many more family members. Malaysia Airlines also announced that 212 personnel from government and media as well as its staff have been deployed to Kiev and Amsterdam in a "special mission" for MH17. "A total of 85 Malaysia Airlines’ 'Go Team' members have been deployed, of which five members will join Malaysia’s Special Disaster Assistance and Rescue Team (Smart) in the search-and-recovery mission at the crash site in the Donetsk region, while 80 other members comprising care givers and the management team will be stationed in Amsterdam to assist the family members of the passengers," the company explained. Bookmark and visit this site regularly for more MH17 crash news.